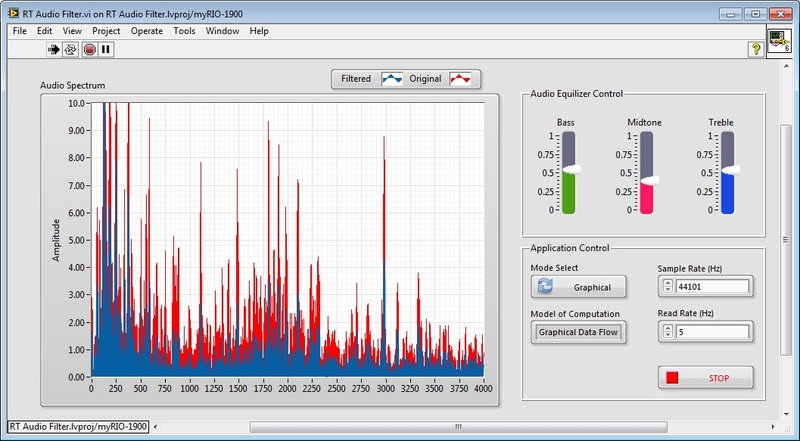 This myRIO application is a simple, 3-band audio equalizer. It allows you to control the amplitude of bass, midtone and treble components from any audio track. ...this application allows you to quickly switch between filters implemented using these two different models of computation. The processed waveform is the same, regardless of which approach you select. Although we have implemented the same processing algorithms using two different programming interfaces, by using LabVIEW the ability to interact with the real world (and deploy to embedded processors) is clean and simple. 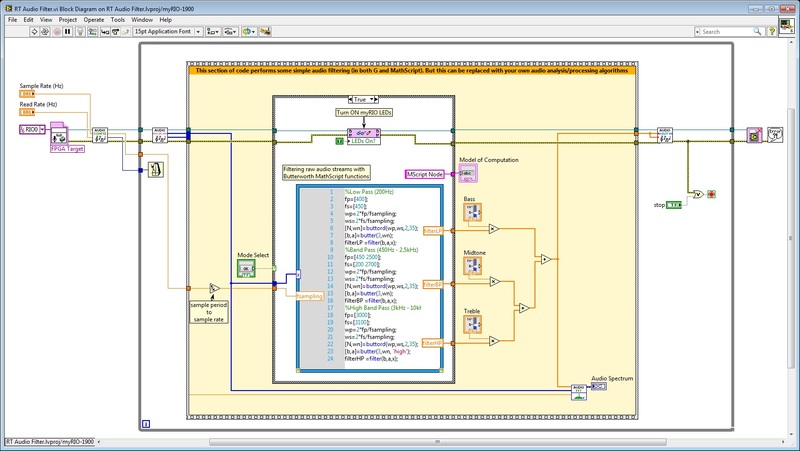 The default FPGA personality used with myRIO supports point-by-point data acquisition. While this is perfect for many applications, certain projects (such as audio processing applications) require waveform acquisition. This project uses a custom FPGA VI (and several DMA channels) to handle the streaming of left/right audio waveforms to/from the myRIO’s real-time processor. I have also created some easy-to-use functions (subVIs) for controlling and interacting with this custom FPGA – meaning that you should be able to reuse this code for your own audio processing projects! Right-click the myRIO target within the project, and select Properties. Ensure that the IP address matches your myRIO. NOTE: At this point, you may need to recompile the FPGA code the first time you run this application. Switch to the block diagram. Notice that the filtering is implemented using LabVIEW’s out-of-the-box filter functions AND a MathScript node. Click the Mode Select button to change the implementation of the filtering. Notice that the myRIO LEDs turn on when MathScript is selected, yet the music sounds exactly the same as the native LabVIEW filtering. Your program has been of much utility to capture and process audio signals. I would enter an audio signal by an MXP entry. Could you give me a hand with this? Thank you so much! I'm hearing a 2 Hz clicking sound when I run it. Is that to be expected? Thanks for the post. I am going to try this It looks interesting. Also gonna try it on other music library.